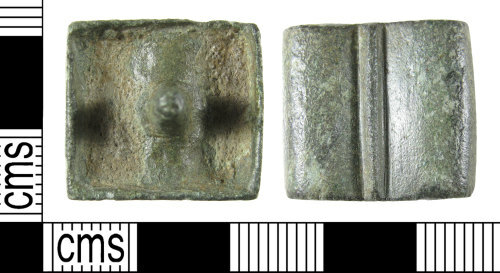 A complete copper alloy Roman horse gear fitting, dating from c. 120 to 250/300 AD. The fitting is square in shape, with a raised line running across the centre. Either side of this the fitting curves, making the two sections D shaped in cross section. The reverse of the fitting is hollow and concave, in the centre is an intergral attachment lug which narrows to a rounded blunt point. The fitting has a mid green patina and measures 19.7mm in length, 18.0mm in width, 9.6mm in maximum thickness and weighs 4.22g. Nicolay 2007, page 384, Pl 73, number 142.1. Nicolay, J., 2007 Armed Batavians: Use and Significance of Weaponry and Horse Gear from Non-Military Contexts in the Rhine Delta (50 BC to AD 450) Amsterdam: Amsterdam University Press page 384, , Pl 73, number 142.1.